It may come as a surprise, but I throw a fairly sizeable Talk Like a Pirate Day party each year. This past September I’d planned out my outfit very carefully, having much of it custom made. Large hat, wool frock coat, bucket boots… I hope it’s not overly bragging to say that I looked quite dashing, and I have pictures to prove it. But that’s where the problem strikes; in each of these pictures – me looking all piratey with my new duds and swashbuckling grin – in each of these pictures I’m holding my piratey beverage in a plastic cup. PLASTIC! Hell, I won’t wear socks unless they’re piratey, and yet here I have a photo album full of me in pirate garb drinking from a plastic cup. I feel such shame. Well mates, never again. I now possess two pieces of drinkware from Quicksilver’s Pirate Pots, the first being a tankard. 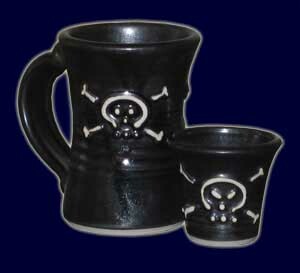 Handspun, glazed to the color of dark graphite, and featuring a raised jolly roger on either side, this is clearly a pirate’s mug. And because pirate’s don’t like to do dishes, it’s dishwasher-safe (as well as food-safe — pirates don’t much like lead-poisoning either.) The handle is a little small, as I can only get three fingers in comfortable (and I have small hands.) But this is easily remedied by strattling the pinky beneath the handle, and in all other respects this is just about as perfect a mug a pirate could ever hope. This entry was posted in Other and tagged drinkware, quicksilver's pirate pots by Bilgemunky. Bookmark the permalink.